This story starts out looking quite good. Here is a young man who is quite wealthy who comes to Jesus with a question grounded in faith. By asking Jesus what He must do to inherit eternal life, this man most likely believed that Jesus had the answer. And in his excitement, he wanted direction from Jesus. 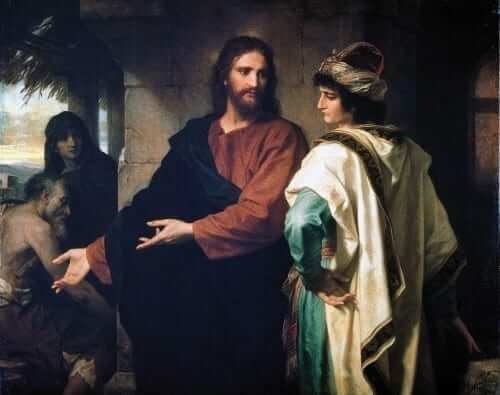 Jesus tells him that he must keep the Commandments, to which the young man responds that he has observed them from his youth. But then Jesus says something that this young man never expected Him to say. He says, “You are lacking in one thing. Go, sell what you have, and give to the poor and you will have treasure in heaven; then come, follow me.” Ouch! This must have stung this rich young man in the heart. The passage continues by stating that this young man walked away sad as a result of what Jesus said. The young man started with good intentions, that is clear. But good intentions are not enough. Following Jesus and gaining eternal life is an all-consuming and radical commitment of every part of our lives. It’s not enough to tell Jesus that we will keep the Commandments, but that’s all. Sure, that may get us into Purgatory, but what we should desire is Heaven! So how do we obtain Heaven? We only obtain Heaven through a life of perfection. Yes, it’s true. If we want Heaven, we must ultimately become perfect in every way. Every worldly attachment must disappear and every sin must be overcome. Our good intentions must turn into a radical and total gift of self to Jesus, seeking Him and only Him. The rich young man walked away sad because he failed to realize that Jesus’ invitation to him to give everything away was actually an act of love. He did not understand that he would find happiness in this radical commitment to follow Christ. Reflect, today, upon the radical call of Jesus in your life. He wants every part of your life. You may have good intentions of trying to be good, but are you willing to go all the way following Christ in a full and unlimited way? Lord, I love You and I want to love You more. I want to love You with my whole being. Help me to realize that following You requires a radical and complete gift of myself to You. May I be ready and willing to let go of any attachment in life that keeps me from following You. Jesus, I trust in You.